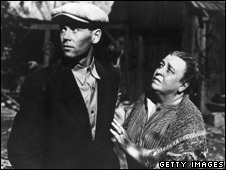 BBC NEWS | Americas | Grapes of Wrath, a classic for today? Grapes of Wrath, a classic for today? The Grapes of Wrath, published exactly 70 years ago, can be seen as a prophetic novel - rooted in the tragedies of the Great Depression, but speaking directly to the harsh realities of 2009, writes Steinbeck scholar Robert DeMott. Steinbeck's epic novel, which traces the harrowing exodus of Tom Joad and his family from blighted Oklahoma (where they are evicted from their farm), across the rugged American south-west via Highway 66, and on to what they mistakenly hope will be a more promising future in California, is considered by many readers to be the quintessential Depression-era story, and an ironic reversal of the rags-to-riches tale favoured by many optimistic Americans. Seventy years ago, on April 14, 1939, The Viking Press in New York officially published John Steinbeck's searing novel The Grapes of Wrath. It was released on the fourth anniversary of Black Sunday, when the worst dust storm in recent American history had rolled across the Great Plains blotting out the sun and later depositing airborne topsoil 1,000 miles east in Washington DC. Steinbeck thought his novel was too raw for wide general appeal: "I've done my damndest to rip a reader's nerves to rags," he told his editor in early 1939. But despite its unflinching detail, gritty language, and controversial reception (the American Library Association includes it among the 100 most frequently banned and/or challenged books), the Grapes of Wrath has attained classic status and appears on many best novels lists. The Grapes of Wrath treats as a national epidemic the wave of widespread foreclosure, uprootedness, migration and homelessness caused by the double whammy of cataclysmic environmental and economic disasters. The thirties was a decade of staggering unemployment in America - as high as 25% in 1933, and still hovering around 19% in 1938, the year in which Steinbeck set The Grapes of Wrath. Steinbeck was not reticent about assigning part of the blame for the catastrophic conditions on the "Bank," the "Company," and the "State"; that is, to faceless, bloodless corporate, institutional, and bureaucratic organisations, so that his novel has an extremely hard, angry edge, though it offers no practical answers for a populace displaced by the shift from agricultural to industrial economies. Steinbeck's partisanship was aided and abetted by his anger over the deplorable conditions under which migrant workers and their families (estimated to be as high as 300,000) lived and laboured once they reached the end of their diaspora in California, his home state. What goes around comes around. For emotional urgency, evocative power, and sustained impact The Grapes of Wrath has few peers in American fiction. Seven decades later it has never been out of print and still sells by the carload. To become a classic, it is often thought that a book needs to transcend its contemporary origins and remain untouched by subsequent history. But it is more accurate to think that a book becomes a classic precisely because it keeps being informed by the most recent historical developments. A literary classic speaks directly to readers' concerns in successive historical and cultural eras. In this sense then, The Grapes of Wrath is a prophetic novel, rooted in the economic and environmental tragedies of the Great Depression, but speaking just as directly to the harsh realities of our own time. At this moment of global economic meltdown, when the whole world is gripped by severe financial recession (much of it caused by rapacious greed, fiscal malfeasance, and corporate arrogance), when groups around the globe are in migration from one kind of tyranny or another, when the gap between rich and poor seems insurmountable, and when homelessness and dispossession caused by widespread financial failure and mortgage foreclosure is rapidly rising in the US and elsewhere - symbolised by shantytowns and tent cities on the outskirts of major metropolitan areas - then it is fitting to think of The Grapes of Wrath as our contemporary narrative, our 21st Century jeremiad. But Steinbeck's impact does not end there. 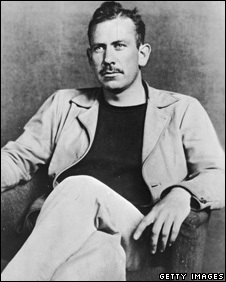 Throughout his career - well into the 1960s - Steinbeck was a writer with a remarkably acute conscience and a deep respect for common sense morality. He carried on a kind of lover's quarrel with America, and warned against runaway materialism, institutional imperialism, intellectual hypocrisy, and rampant greed - all inevitable and regrettable by-products of an advanced industrialised capitalist society. "If I wanted to destroy a nation," he wrote in 1966, "I would give it too much and I would have it on its knees, miserable, greedy and sick." It is impossible to know how Steinbeck would have reacted to our current malaise, fuelled in part by unbridled financial speculation and lax governmental oversight, but it is tempting to think, given the outcome, he might have said, "I told you so." Robert DeMott is Professor of American Literature at Ohio University and a former director of the Steinbeck Research Center at San Jose State University in California.